' reincarnation of the long retired brand features an an all-painted series that is based on the original Chicle design. 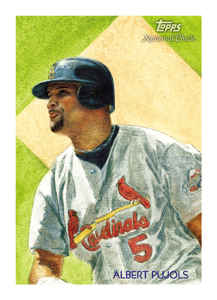 330 Veterans, Rookies and Retired players are portrayed on painted cards. Fifty-five of these diamond stars will be short-printed and inserted 1:4 packs. NATIONAL CHICLE RELICS: 40 rookies, veterans and retired greats are spotlighted with a piece of personal memorabilia. • TOPPS UMBRELLA RED BACK: All are hobby exclusive 1/1's. • TOPPS UMBRELLA BLACK BACK: Numbered to 25. • BAZOOKA BACK: Numbered to 99. • NATIONAL CHICLE BACK: Numbered to 199. 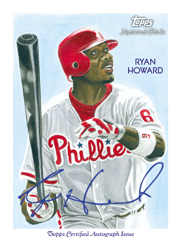 ALL AUTOGRAPHS ARE SIGNED ON-CARD NATIONAL CHICLE AUTOGRAPHS: 35 rookies, current and retired stars appear with their signatures. • TOPPS UMBRELLA RED BACK: ONE OF ONE! HOBBY ONLY! • PRINTING PLATES: ONE OF ONE! HOBBY ONLY! • TOPPS UMBRELLA BLACK BACK: Numbered* to 25. • BAZOOKA BACK: Numbered* to 99. • NATIONAL CHICLE BACK: Numbered* to 199. PRINTING PLATES: 1,320 card front plates. All are hobby exclusive 1/1's. COWHIDE: Simulated cowhide cards. All are hobby exclusive 1/1's. UMBRELLA RED BACK: Card backs featuring the iconic Topps “umbrella" logo and are all hobby exclusive 1/1's. ARTIST PROOF: Each card is signed directly on-card by the artist and numbered to 10. UMBRELLA BLACK BACK: Card backs feature the iconic Topps “umbrella" logo and are numbered to 25. 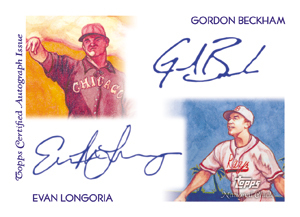 BAZOOKA BACK: The Bazooka logo is celebrated on each card back. 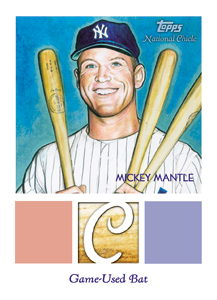 NATIONAL CHICLE BACK: The original Chicle logo highlights each card back. CABINET CARDS: 25 painted base cards are enlarged to Cabinet-size. Signed by the artists and numbered* to 50. 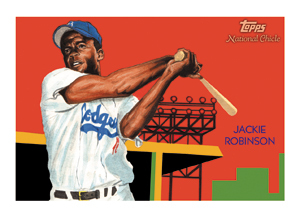 I would give Topps National Chicle a 4/5. The autos are pretty weak besides hitting a Yaz or Musial. The base cards are awesome looking with every card being a work of art. I personally like the artist proof cards and have started to collect them, so I would give the set a 5/5 and the autos about a 2/5. 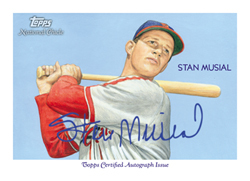 Mediocre autographs and a decent card design deserves only three stars. 4 / 5. I absolutely LOVE the hand-painted look, and the designed mid-20th century Swiss style backgrounds. But, as two other users and a staff member have said, it is missing autos. As much as I love the artwork, it is still a baseball collection hobby. Gotta have the autos. Loses 1 star for this. Still an excellent product.